Home / News / 1 Events Media Host a Speeding Success! 1 Events Media Host a Speeding Success! 1 Events Media hosted a fully-booked business networking event yesterday afternoon, with nearly 60 cross-sector businesses in attendance. The event was sponsored by Enterprise4all NW and Lancashare, who also gave excellent presentations during the session, to a variety of delegates from across the financial, media, advertising, education, hospitality and legal sectors of north west businesses. The venue was the popular HSBC Lancashire Commercial Centre in Preston. 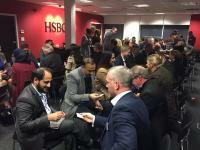 Mubarak Chati, Managing Director of 1 Events Media said: “We were delighted with the number of businesses that joined us for this exciting event. The speed networking experience was especially well received as a fun and fast way for our delegates to meet a high number of quality new business contacts.